The Marine Spares industry and Port Authorities require constant “uptime” as they exist in a 24/7 work environment, whether it be for driveshafts, overhead cranes or fork lift trucks. Special Solutions: The first of many is the use of Split Roller bearings which allow for rapid bearing replacement especially at difficult to access locations, such as driveshafts. 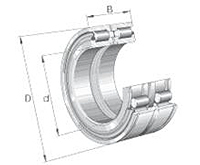 For the Sheave wheels, cranes and tensioner blocks we recommend the SL Sheave Wheel bearings. These provide extra high dynamic and static load ratings and come with rubber seals to prevent water and dust intrusion. To keep the unloading process from slowing down we can provide cut to length leaf chain forklift chain on a 24 hour basis. Our Worldwide freight relationships allow us to serve markets around the world so that our bearings can meet the ship at the port if necessary.